One of the world's leading international airlines, Emirates, has advised that it will deploy a one-off A380 service to Islamabad on 8 July 2018. The airline’s iconic double-decker will make its inaugural arrival in Islamabad on a special flight EK2524/EK2525. The Emirates A380 aircraft on this special one-off service will be in a two-class configuration offering spacious seats in Economy Class and fully flat-bed seats in Business Class as well as Emirates’ popular Onboard Lounge. 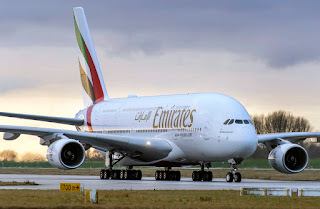 Passengers in all classes enjoy free Wi-Fi to stay in touch with family and friends and Emirates’ multi-award winning ‘ice’ in-flight entertainment with up to 3,500 channels of movies, TV programmes, music and podcasts on the industry’s biggest personal screens in each class of travel.